Saltburn-by-the-Sea is a little coastal town in North Yorkshire that has been put on the map by a rather unusual attraction! 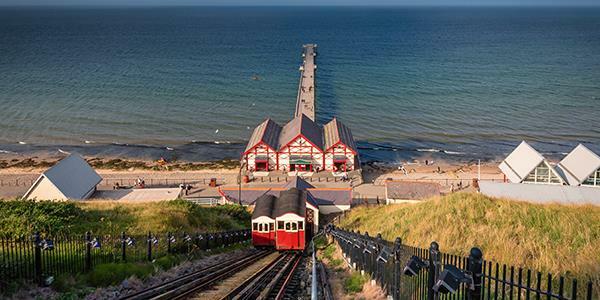 Saltburn is a quaint Victorian town north of Whitby with pretty gardens, old buildings, a listed pier and, perhaps most importantly, the Saltburn Cliff Lift! 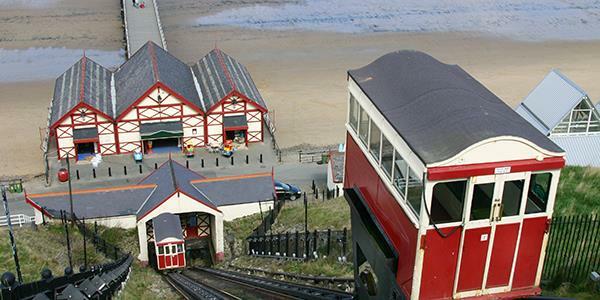 Saltburn Cliff Lift is one of the world’s oldest water powered funicular railways, having first been opened in 1870. A funicular railway is a cable-operated rail car that ascends and descends steep cliffs. They aren’t common nowadays, and the fact that this one is water balanced makes it even more unusual. Water tanks under each of the cars are filled and emptied in order to allow movement. The car at the top is filled to make it heavier and as it descends it pulls the lighter car up. When it reaches the bottom it is emptied and the process is repeated. But why was it built? 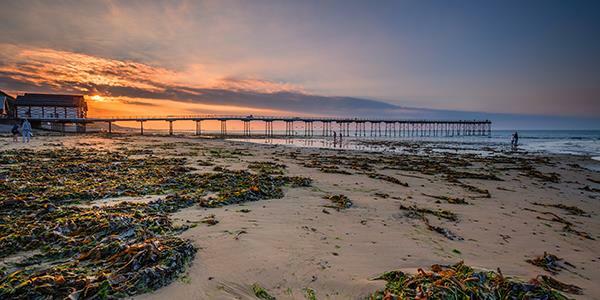 Well, the long Saltburn Pier was constructed in 1869 following an influx of holiday makers to the town. Unfortunately, because the town itself lies higher than the pier and beach, access to both proved difficult and there were concerns that visitors would be put off. An engineer was contracted to come up with a solution and created a wooden hoist capable of carrying up to 20 passengers down the cliff, using water in a counterbalance tank. This first version of the Saltburn Cliff Lift opened in 1870. After some years in operation the original was demolished in 1883 and by 1884 a newer, safer version had been rebuilt by George Croydon Marks. The track length is 207 feet and the design featured two 12-people cars running on parallel funicular railway tracks. Little has changed to the design since opening, though it has undergone various refurbishments over the years. In 2011 and in 2014 a number of redesigns took place to the cars and the upper station to ‘re-victorianise’ its appearance. The passenger cars are now wooden again with lovely stained-glass windows – just as they would have been originally. From the lower station of the Cliff Lift you will have direct access to the pier. Built in 1867 by John Anderson, the pier was constructed as the result of an increase in tourism. It is now one of very few piers left remaining in Yorkshire. In 2001 after a number of refurbishments, the pier opened as a Grade II listed monument and had beautiful under deck lighting installed. The town is full of lovely Victorian buildings including the elegant houses that line the town and overlook the beach. Saltburn was developed by Henry Pease, the director of Stockton and Darlington Railway during the mid 1800s. He saw huge potential with the area and he had the Zetland Hotel built as one of the world’s earliest purpose-built railway hotels. It was built in the Italian style and dates from 1861. It is located along the front and looks out over the sea, but in the late 1980s the building was converted into apartments. You can take a walk in the Valley Gardens, enjoying the wooded scenery and Skelton Beck, which flows through the valley on its way to the sea. There is a Woodland Centre half way round and the garden paths are surfaced. These gardens open out into the Italian Gardens which is a pretty public park laid in the Italian style. Saltburn is just over half an hour from Rosedale. Head north on Knott Road and follow the sign towards Castleton. From here take Station Road and keep heading north! Find out how to stay in the North York Moors by entering your details at the bottom of the page or click the button below.